Rigging Harness Adapting with rigging harnesses Rigging harnesses are a composition of electric wires, that are equipped with isolations and corresponding protection appliances as well as contacting devices. Rigging harnesses serve to connect a unit under test electrically replacing the original cable harness. As opposed to the original harness the rigging harnesses must be designed for thousands up to several hundred thousand mating cycles. 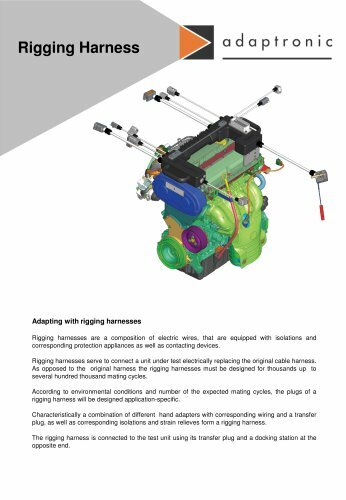 According to environmental conditions and number of the expected mating cycles, the plugs of a rigging harness will be designed application-specific. Characteristically a combination of different hand adapters with corresponding wiring and a transfer plug, as well as corresponding isolations and strain relieves form a rigging harness. The rigging harness is connected to the test unit using its transfer plug and a docking station at the opposite end.